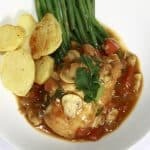 Succulent Seafresh Chicken Breasts in a classical Chasseur sauce. Coated the Chicken breasts in seasoned flour. Shallow fry in a large shallow frying pan for 3-4 minutes each side on a medium heat. Cover the chicken in an oven proof dish and place in a pre-heated oven approx 160 deg C for 10 - 15 mins. Gently fry the chopped shallots in the butter & olive oil without colouring using the same pan. Add the sliced mushrooms and cook for a further 2 -3 minutes. Strain off the excess butter. Add the white wine and reduce by 1/2 on a medium to high heat. 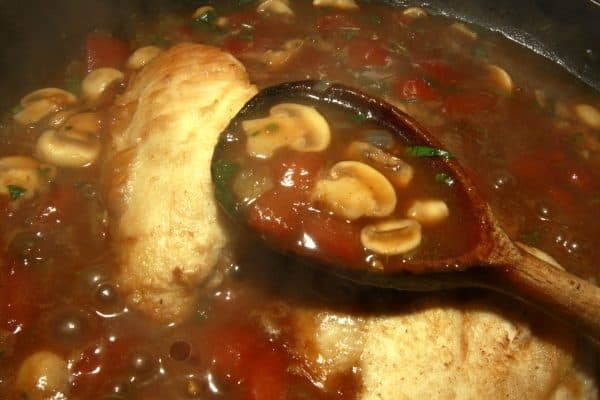 Add the tomatoes followed by the demi glace and simmer for 5 - 10 minutes. Correct the seasoning and add the parsley and tarragon. Add the Cooked chicken back to the pan along with any juices. Serve with your favourite vegetables and potatoes.